Okay, I’m back with Part II of my High Point Market adventure with the Esteem Media “Fall Bloggers Tour” & am STILL dizzy from how much we saw & covered there! So as not to overwhelm you, I’m zeroing in on a few things that were really beautiful AND that we can all do in our homes, no matter style or budget. My main takeaway from seeing so many showrooms, one after the other, is that the more thoughtfully designed & detailed rooms and vignettes really transcended everything else. Putting something personal into a piece, a touch that you LOVE, will absolutely shine through. And it doesn’t have to be expensive, as you’ll see! 1.) Original art makes all the difference. 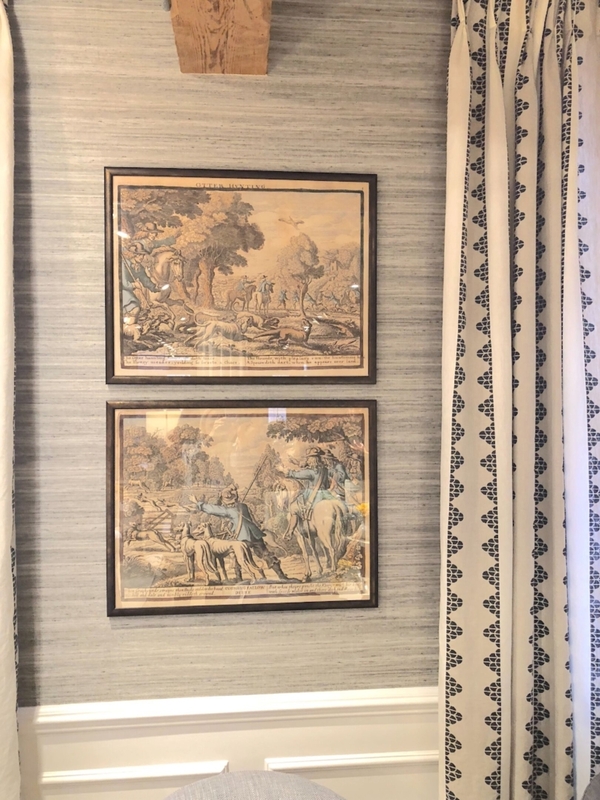 The Modern History showroom featured lots of versatile sleek furniture pieces in variety of finishes, which were all elevated by the incredible collection of original French oil paintings from the 1930s & ‘40s….It gave all the vignettes so much more depth & interest! The more original & personal the art, the better. 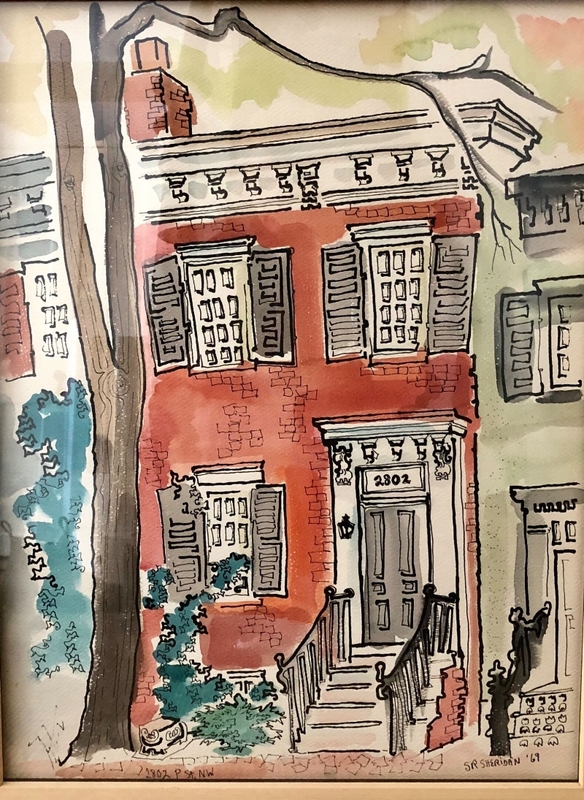 In my house, I FINALLY got the old watercolor of our house that was done by the previous owner 50 years ago framed, so that makes me happy…. 2.) Note to self: find easy ways to layer in more pattern. As I looked back on all my photos from High Point, the ones that really captured my imagination all had beautiful pattern. We can all get lulled into playing it safe with the conventional formula of beige and neutral furniture, accented by (a too-often-used phrase that I’ve come to loathe) “pops of color” — but what about the middle ground, where we can weave in multi-colored, multi-patterned pieces on top of those neutrals?? It gives the eye so much more stimulation & wears better in the long run because you won’t get bored of it! What makes these combo’s above (from Thibaut Fine Furniture even MORE practical is that the neutral sofas are available in Crypton Home Fabric, which is pre-treated with incredible stain fighters but feels 100% just as soft as the original fabric (note: I am VERY picky about how fabrics feel & these were incredibly soft). They showed us a demo with spilling juice on it & it came right up. Wish I had that when Avery & Haley were toddlers! Last but not least for pattern — Norwalk Furniture showed us an incredible array of furniture, with many pieces designed by LA-based Kim Salmela who is fascinating! She fell into interior design by way of party-planning for the late great Prince in Minneapolis (long story for another time :). For now, just a couple of vignettes to enjoy! 3.) Whenever you get a chance to add some original details that feels interesting to YOU, go for it: it will really make the whole room sparkle. It was fun to see how even a small change, a nuance or detail can make such a difference. Here are a few that I loved & am going to try to copy in my own home some way!! * Curved furniture? Sounds radical for a traditionalist like me but look how pretty this piece if from Modern History? Subtle but makes it more interesting. * A stripe here or there — I adore this chair from Cisco Brothers! If you were reupholstering something, you could add a ribbon stripe accent & it would totally transform the piece…. …to wit, I just bought a vintage fabric remnant from my friend Sonya (Instagram: @sonya.flanagan.vintage) for $40 & am thinking of creative places to use!! * Updated classic pieces — these dining chairs are a reinterpretation of the French original, designed by the Antiques Diva (Toma Clark Haines) & Aidan Gray, & were a huge hit at High Point! They have a lot of personality but also of course, sturdy & practical. Even just one of them, piled high with books as an occasional chair, would add a lot of panache to an otherwise traditional or classic living/dining room. Okay, I think I’ve worn you out now, so I better go. Thanks for following my journey (you can see more on Insta @elegant.mayhem) & hope you all have a wonderful Thanksgiving! !